My commute to work is about 45-60 minutes each way depending on the traffic. In the evening I usually listen to an audio book, but most mornings are spent listening to “Seize the Day” with Gus Lloyd on Sirius XM - The Catholic Channel. For an unknown number of years (at least the last two that I've been listening) Gus uses Project Christmas to support Food for the Poor, the largest international relief and development organization in the United States. After a week of feasting and a weekend of shopping, it’s time to pause and support those around the world who will have no Christmas. This morning, Gus hosted special guest, Food for the Poor Executive Director, Angel Aloma, to talk about how Food for the Poor as an interdenominational Christian ministry serves the poor in 17 countries throughout the Caribbean and Latin America, providing housing, healthcare, education, fresh water, emergency relief, and micro-enterprise assistance to hundreds of thousands of people. Listening to the people call in on Seize the Day and talk their donating and who they are honoring and why so was uplifting and inspiring. Various people called to donate in memory of a loved one who died this year. Others called to donate to feed or clothe three children on behalf of their own three children. And so it went all morning. It got me thinking that lately I've been writing about the corporal works of mercy, that we should be actively waiting for Christ, and that means Do Something. Wouldn't it be great if everyone who visits Of Sound Mind and Spirit went over to Food for the Poor and bought a fruit tree for just $10? 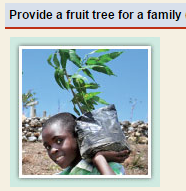 We could provide a whole orchard of fruit trees for people. $31 clothes a child for year. $41.80 feeds a child for a year. Maybe you want to donate three little piggies: three little piggies only cost $100. Of course there are more opportunities than this short list. So here is your Advent/Christmas Project Challenge dear friend, if you feel so called, please join me in donating just $10 towards this worthy cause. Then come back and leave us a comment to let us know who you are honoring with your donation. I hope you'll join me and together we can do something.